The Journal of Southeast Asian Human Rights (JSEAHR) explores human rights realities in South East Asian region from various perspectives. 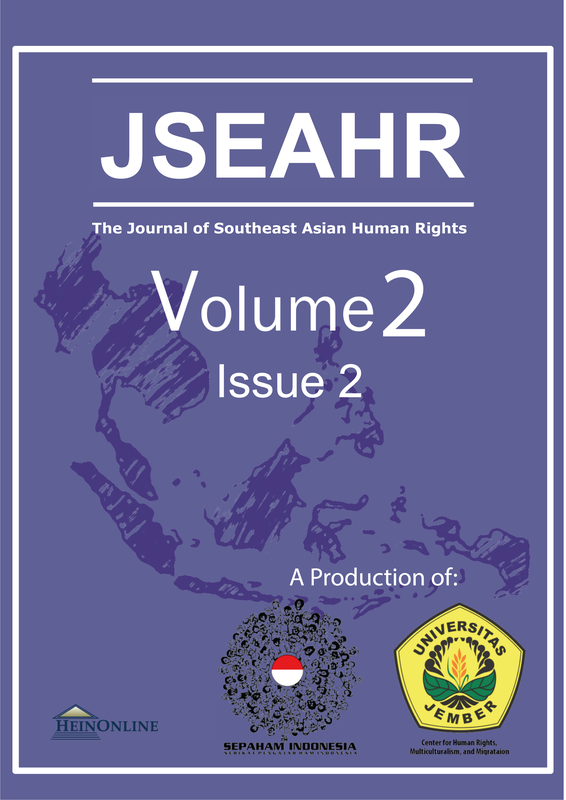 The JSEAHR is a peer-reviewed journal co-organized by the Indonesian Consortium for Human Rights Lecturers (SEPAHAM Indonesia) and the Centre for Human Rights, Multiculturalism, and Migration (CHRM2) University of Jember. The Journal welcomes empirical, multi-disciplinary, and doctrinal approaches to explore historical and recent situation of human rights in South East Asia. The combination of editorial board members from South East Asia, Europe, and Japan creates a unique forum for South East Asian and other scholars to exchange ideas of interest about human rights issues in the region. This work is licensed under a CC Atribution-Noncommercial 4.0 License.